We provide a large variety of transformers, starting at 25kVA up to 20mVA depending on our customer's needs. 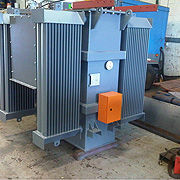 We design all our transformers according to customer requirements. All our Mini Substations are powder coated to customers specification and supplied coastal ready where applicable. On offer is a wide variety of elctrical consumables including lugs, ferrules, cable, breakers, disconnectors, insulators, meters and measuring instruments. Our industrial range consists of most types of fastners, abrasives, adhesives, cleaning equipment and chemicals, oils, tools, electrical hand tools, drill bits and tapes. 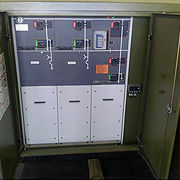 This company supplies Products & Services in the Architectural, Automotive, Building & Civil, Chemical, Communications, Electrical, Electronic, Food & Beverage, General, Instrumentation & Control, Manufacturing, Marine, Materials Handling, Mechanical, Metals, Steel & Metalworking, Mining, Petrochemical, Oil & Gas, Pharmaceutical, Power Transmission, Transportation, Warehousing & Storage, Water & Wastewater Treatment industries.